Terrance Mitchell is back. The Browns announced that they’ve activated the defensive back from the injured reserve. To make room on the roster, the team placed TE Pharaoh Brown on the IR. 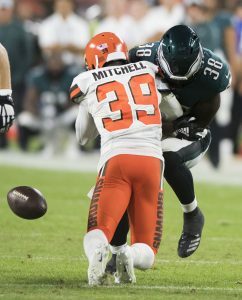 Mitchell signed a three-year, $12MM deal with the Browns this offseason, and he proceeded to start each of Cleveland’s first three games. The 26-year-old was productive during the early stretch of the season, compiling 19 tackles, three passes defended, two forced fumbles, and one interception. This followed a 2017 campaign where he established career-highs in tackles (53), passes defended (18) and interceptions (four) with the Chiefs. Mitchell ended up fracturing his wrist in late September, landing him on the injured reserve. With the former seventh-rounder back on the active roster, he’ll be joining a cornerbacks corps that currently features T.J. Carrie, Denzel Ward, Phillip Gaines, Tavierre Thomas, and Juston Burris. Brown has split the season between the Browns’ active roster and practice squad, and he’s been listed as inactive for Cleveland’s past five games. The move now leaves the Browns with four tight ends in David Njoku, Darren Fells, Seth Devalve, and Orson Charles. Today’s workout updates are below. There were some notable names, including veteran quarterback Landry Jones, who was released by the Steelers at final cuts. Looks like the Browns are searching for defensive help, working out a slew of players on that side of the ball. Jones working out for the Patriots is interesting, as he isn’t really young enough to be seen as a developmental project, and Brian Hoyer is entrenched as Tom Brady‘s backup.